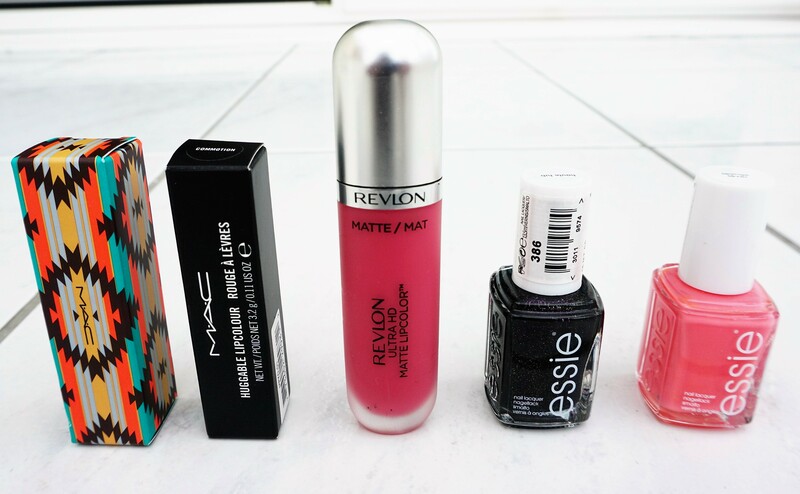 I love reading articles on other make-up blogs featuring new make-up and beauty purchases. It made me think, why not do something similar on my own site? I know the excitement I feel when I purchase new beauty products, so I thought it might be fun to add this type of post to my own site. Do you like reading this type of post? Would you like it to be a more regular feature on the site? Let me know in the comments section. 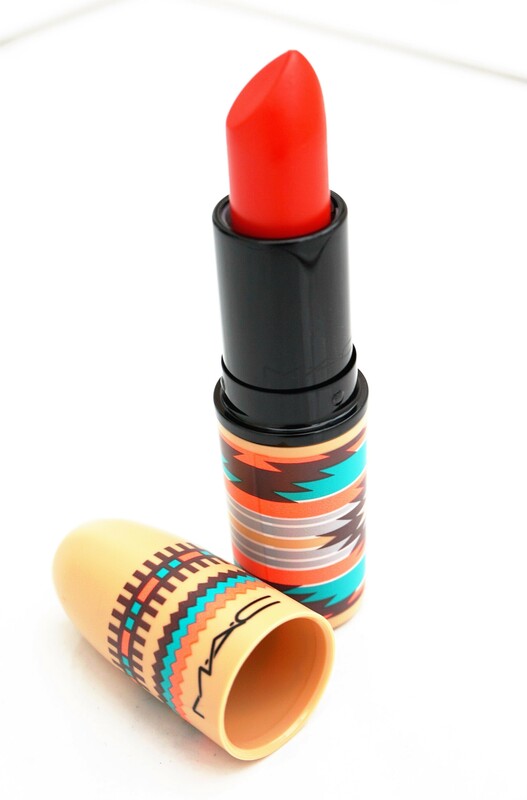 MAC ‘Painted Sunset’ lipstick (see pic below) is a limited edition shade as part of their current ‘Vibe Tribe’ collection. I have been on the look out for a while for a vibrant, orange-red lipstick but I haven’t been able to find one in quite the right hue or finish. You are able to test lipsticks at the MAC counter on your lips, as they sterilise them for you (they usually leave little beakers with make-up disinfectant). One swipe of this lipstick on the lips and I was sold! 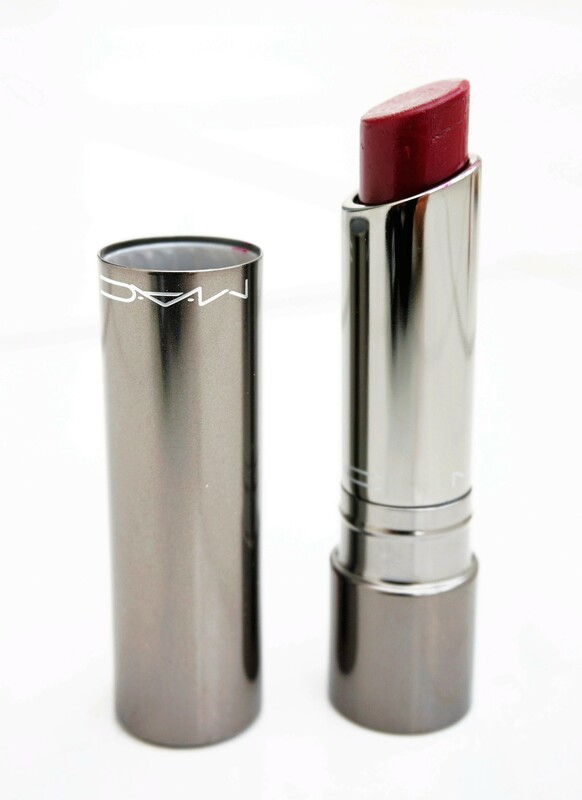 This particular shade comes in MAC’s ‘Amplified Creme’ finish, and so it gives a creamy, satin finish to the lips. Really nice to find an orange-red lipstick in this type of finish, as there has been such a big move towards matte and demi-matte finishes recently. This particular lipstick costs £17 and is available at House of Fraser, Debenhams, Harvey Nichols and various other retailers. MAC Huggable Lip Colour is one of my all-time favourite lipsticks. They brought the range out last year (I think) and then they launched it again this year. I already have two Huggable lip colours from past collections (‘Fresh and Frisky’ and ‘Cherry Glaze’) and picked up the shade ‘Commotion’ this time (see pic below). ‘Commotion’ is a beautiful deep berry-plum shade and I can imagine it looking great with neutral, gold, silver, pink and purple eyeshadow looks. This particular lipstick (as well as the other Huggable Lip Colours) costs £18 and is available at House of Fraser, Debenhams, Harvey Nichols and various other retailers. Matte and demi-matte lip colours have been huge this year. I saw in Boots that they had the new ‘Revlon Ultra HD Matte Lipcolours’ in stock and so I swatched all of the shades on my hand to see what they were like. I don’t wear matte lip products very often, as I can find them a little drying on the lips. I really liked the texture of this particular product, though, so I decided to pick one up to try (they also had £2 off, which helped). I picked up ‘Devotion’, which is a medium peachy-pink shade. 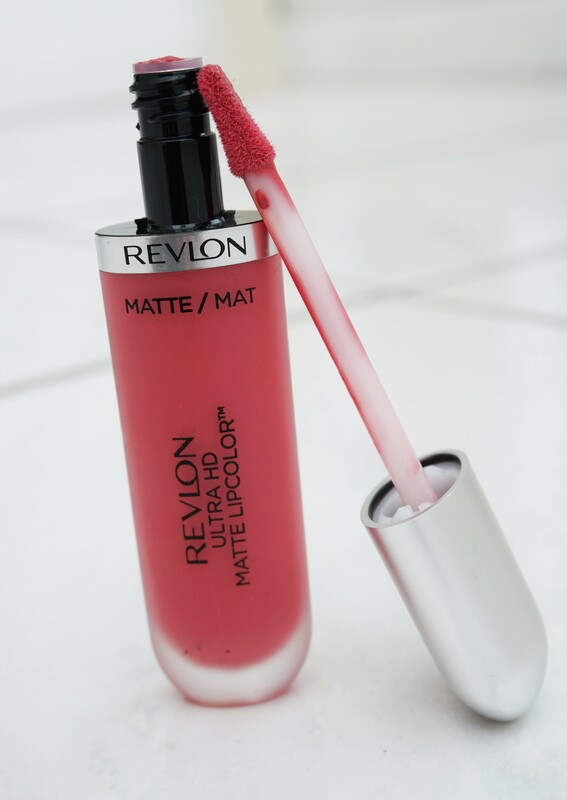 The product is matte, but it feels silky and glides on really beautifully. I can see this shade being lovely alongside smoky blue and green eyeshadow looks. This product costs £8.99 and is available at Boots, Superdrug and various online retailers. I was really thrilled by the bargain I got on these two Essie nail polishes. 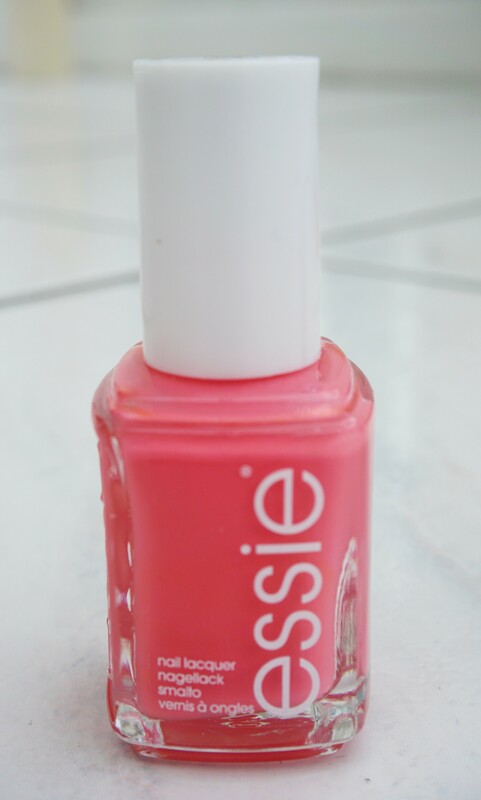 Essie nail polishes normally cost £7.99 in Boots and Superdrug. I found these two particular shades marked as ‘£2.50’ each at the reduced section. At the time, they had a ‘buy 1 get 1 half price’ deal in Boots but I didn’t think I’d get anything off on discounted stock. At the checkout, though, the deal still applied and so I got one for £2.50 and the other for £1.25!! What a bargain (happy happy face!!!!)!!!! I got the shades ‘Lounge Lover’ and ‘Haute Tub’. ‘Lounge Lover’ (see pic below) is cream-finish, slightly neon peachy-coral. I tried it out this week and looooove it so much! My hands are a little tanned at the moment from all of the sunny weather we have had recently in Glasgow (I know, sunshine in Glasgow?!?! Awesome!) and the shade really pops against a tan. 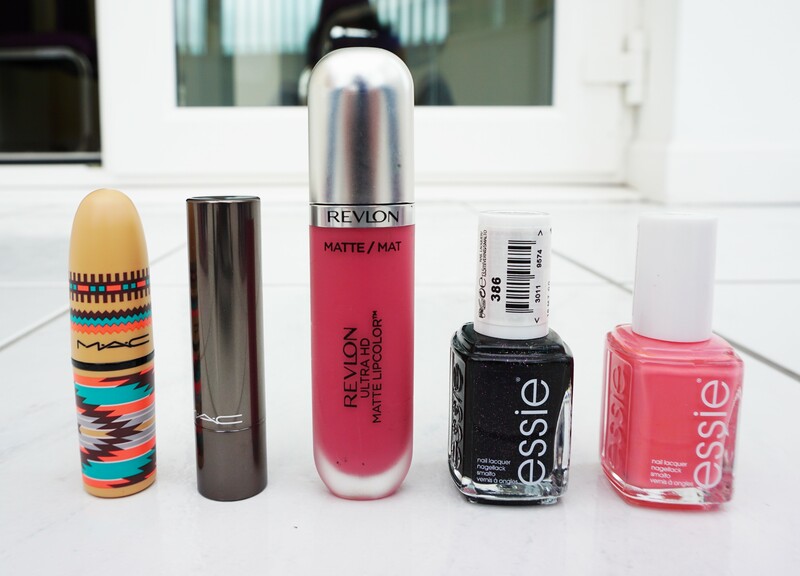 So perfect if you are going on holiday! 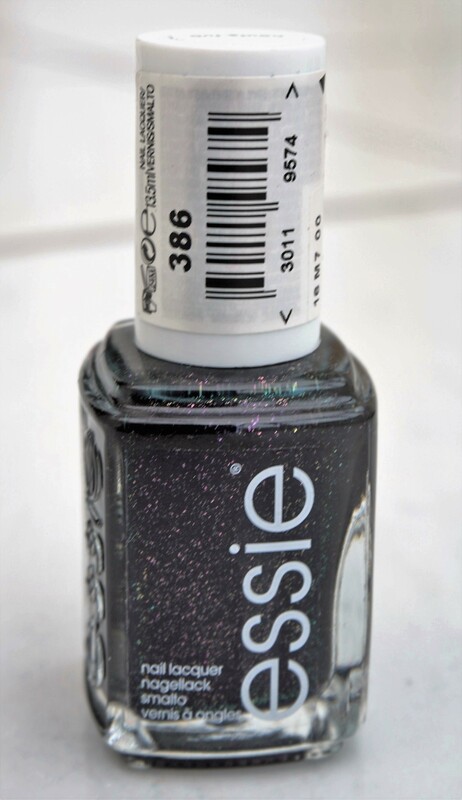 Essie nail colour in ‘Haute Tub’ is a pearly, black shade infused with micro silver and purple sparkles. I can imagine this shade being super pretty on the nails when it catches the light. So those are the new products that I bought last week. Happy happy me :o). Have you tried any of these products? Or have you bought anything new that you love and want to share? Let me know in the comment section below. Glad to hear you enjoyed reading the post. I love reading these types of articles myself. Always fun to find out about new products! Oh, I should also mention that Lady Danger is a permanent shade but Painted Sunset is limited edition. So worth checking out Painted Sunset if you like the look of it. Is the Painted Sunset shade same as or similar to the Lady Danger shade? It’s very similar, actually. The main difference is that Lady Danger has a matte texture but Painted Sunset is more creamy with a slight sheen. Both are gorgeous; it just depends on what type of look you are going for.